Louisa Gosling, WaterAid’s Quality Programmes Manager, introduces a guide to using the status of water and sanitation as human rights to drive progress on the ground, and explains how marketing strategies can help us reach our target audiences. The UN officially recognised the human rights to safe drinking water and sanitation in 2010. But what does this actually mean for work on the ground? For people living in rich countries, where heavily regulated utilities supply the population with water and collect and treat wastewater, rights to water and sanitation are mainly covered by enforceable domestic laws and regulations. Independent inspectorates and complaints mechanisms ensure service providers can be held accountable to service users. But for people living in countries with very poor access to water and sanitation services, it is a different picture. For the nearly 2.4 billion people without access to adequate sanitation, and 663 million without access to clean water, these systems are often not in place. The lack of access is due to lack of capacity and resources in the sector, weak demand by service users, and poor accountability of service providers to users – their rights are neither demanded nor fulfilled. The human rights framework clearly assigns responsibilities – people have the rights to water and sanitation services, and governments are duty bound to realise them. But what does that mean in practical terms for government, especially local government officials, who are closest to the people? How can the human rights actually help local officials to reach everyone, even when they have very limited resources and capacities? With more countries integrating human rights to water and sanitation into national systems there is an opportunity to explore the difference this can make to both providers and users of water and sanitation services. The UN Special Rapporteur’s handbook on realising the human rights to water and sanitation sets out the practical implications in considerable detail, which is helpful. But it is too long and detailed for many practitioners to use. So, WaterAid, WASH United, End Water Poverty, University of Technology Sydney, UNICEF, and the Rural Water Supply Network joined forces to develop guidance specifically aimed at local government officials. We worked with a content marketing agency, C3, to help make a really user-friendly guide. Image 1: Finding out what the user wants to know. To find out more about our target audience the ‘Making Rights Real’ project partners, funded by players of the People’s Postcode Lottery, carried out an audience analysis. First, we interviewed local government officials in low-income settings to learn what they thought about their responsibilities for reaching everyone everywhere with water and sanitation. We wanted to know what helps them, what makes their work difficult, and what can help to inspire them. We presented the resulting paper – ‘Achieving universal and equitable access to water, sanitation and hygiene (WASH) for all – practitioner perspectives and perceptions ’1 at the Rural Water Supply Network forum in Abidjan. Image 2: Some of the challenges local government officials face, according to audience analysis. The report clearly showed the many challenges that local government officials face, and their low understanding of human rights as something relevant to their work. So, working with C3, we used these interviews to develop user ‘personas’ to help us better target the content of human rights to our audience. Image 3: Local government user personas adapted from C3. We decided to target our materials towards the would-be heroes. The analysis defined this audience segment as a large group of people working in local government, who feel personally committed to providing services to local people but are constrained and thwarted by lack of resources and political support. We agreed that if this group were empowered and supported some of them could become superheroes and really help progress. Champions within institutions can have a huge impact. For example, the WaterAid-commissioned research ‘A tale of clean cities’ found that one of the main drivers for improving urban sanitation was committed champions at the municipal level. The would-be heroes have many misconceptions about human rights. For example, they often believe that if water is a human right it should be provided to everyone free of charge, which is clearly incompatible with governments needing to raise revenue to help run sustainable services. However, the human rights standards state that it is fine to ask people to pay for services, as long as the tariffs are affordable. We also discovered the many different groups that influence the would-be heroes’ actions and decisions (see image 4). We learned how important it is to recognise these influencers, to galvanise as much support, advocacy, and collaboration as possible from them in order to achieve adequate and sustainable services for all. Image 4: Influencers of local government officials. Adapted from a C3 slide. We wanted to create a guide to help support and nurture sector champions. To clarify to local government officials the usefulness of human rights thinking, we used the analysis to design a colourful three-piece guide – ‘Making Rights Real’. The idea is for sector partners (like WaterAid) to use the materials in conversations with government partners. The guide comprises: the pocket guide, containing basic thoughts and principles; the manual, with each step explained; and the journey, which shows the process at a glance. You can download the guide (currently in English, French, and Portuguese) and instructions, from the Rights to Water and Sanitation website, and use them in your working relationships with governments. We launched the materials at the Rural Water Supply Network Forum (RWSN) in Cote d’Ivoire, using presentations, discussions, and role play. The response from participants was very promising. There is a strong desire among people in the sector to know more about human rights and how they can use them to clarify responsibilities of governments, communities, service providers, and service users, and make everyone more accountable to provide adequate and sustainable services for all. If we are to reach everyone everywhere with access to water and sanitation by 2030, as promised in the UN Sustainable Development Goals, a change in approach is needed. These essential human rights can only be delivered if those with the duty to deliver them are empowered and inspired to do so. 1Keatman T, Carrard N, Neumeyer H, Murta J, Roaf V, Gosling L (2016). Achieving universal and equitable access to water, sanitation and hygiene (WASH) for all – practitioner perspectives and perceptions . Making Rights Real project team. See the presentation here. Louisa Gosling is Quality Programmes Manager at WaterAid. She tweets as @louisagosling1 and you can read more of her blogs here. Of course the title is a rhetorical question – no one really expects one specific approach to transform the whole water sector, let alone save the world. Nevertheless, Self-supply as a concept is gaining traction and prominence in the sector as I witnessed during the 7th RWSN Forum, which took place from November 29 to December 02 in Abidjan. Just a couple of years ago, the term “Self-supply” did not even exist. In fact, it was coined within RWSN as part of a strategic planning exercise in 2004, where Self-supply was defined as one of the flagships of RWSN. Of course, people providing water for themselves (“Self-supply”) is a process which has been going on for millennia and all over the planet (for example, some 44 million people in the US today rely on Self-supply for their drinking water), but Self-supply as a term was born in 2004, and the idea that this approach can (and should) be fostered by specific activities and frameworks both by government and other actors still is relatively new to many people, even within the water sector. In this blog entry, I would like to reflect on some aspects of this learning journey of the past 12 years, and I invite you to reply, discuss, disagree, criticize or support, whatever suits you best. But first things first: The 7th RWSN Forum was a massive success, both in terms of participation and outreach, but also specifically for the Theme of Self-supply: I identified at least 7 sessions where papers related to Self-supply were presented, some of which I was not even aware of before the Forum. For example, Sara Marks of Eawag (Switzerland) presented some results of a study from Burkina Faso (feel free to read the respective paper and presentation) where they looked into the various benefits of a project implementing a (subsidized) Self-supply approach to facilitate multiple-use water services (MUS). Among other things, they found that the water of households who had invested in an upgraded private well and equipped it with a Rope Pump was of better quality than that of unimproved wells. Meanwhile, session 6A was designed to provide an update on the “state of the art” in Self-supply, including an overview paper of André Olschewski, a case study from Sally Sutton on Self-supply in some African countries, an overview of how Self-supply can be accelerated in Ethiopia, and an example of how capacities in the private sector can be strengthened through SMART Centres (or watch the movie on the SMART Centre in Zambia here). In several other sessions, specific aspects of Self-supply were analyzed in more detail, for example by Patrick Alubbe of water.org, who made a case for micro-credit as a scalable intervention who can help more people gaining access to higher level of drinking water services (see the paper of Gupta and Labh and Patrick’s presentation). Apart from this wide and deep presence of Self-supply in the thematic sessions, the concept also made a splash at key moments of the RWSN Forum: For example, it was prominently mentioned by the final remarks of Mr. Jonathan Kamkwalala, a senior manager of the World Bank, during the closing ceremony. 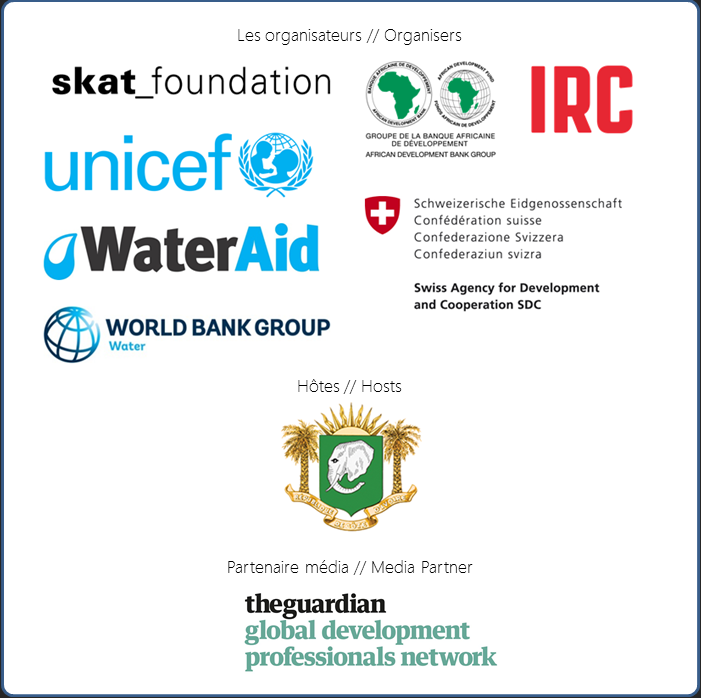 Moreover, more than 150 people signed an informal “Call to action”, which suggests that Self-supply deserves more attention on behalf of governments, donors, civil society organizations, researchers, and other key players. The undersigned expressed a “strong interest in developing support for Self-supply within our own spheres of activity and urge all development partners to explore this approach and reach its considerable potential”. Given this strong support by a large number of people, I hope that we will see a lot of action in this field in the weeks and months to come – for example by starting to monitor and report on Self-supply within organizations, regions, and eventually countries and globally. As we know, we do not manage what we do not measure, so measuring definitively would be a good start. 1. Self-supply means abandoning the poor. 2. Self-supply means that government has no role to play. 3. Self-supply is incompatible with the Human Rights to Water and Sanitation. For the moment, I will only respond to the third misconception. It can readily be clarified, simply by listening of the presentation of the UN Rapporteur on the Human Rights to Water and Sanitation during a webinar hosted by RWSN last year (e.g., read this summary), where he makes it clear that Self-supply is in line with the progressive realization of these Human Rights. And this hint also helps clarifying the first misconception: Self-supply does not imply abandoning the poor, but supporting them in a different way – rather than the government itself providing services, it facilitates and strengthens the private sector (and civil society organizations) to provide them. Thus, rather than abandoning the poor, what Supported Self-supply does is actually empower them and enable them to take on a more active role in moving up the ladder of water services. Importantly, the Government has to play a role in Supported Self-supply – in fact, it is a crucial role consisting of several functions (adequate policy framework, building up capacities, oversight of the private sector, etc. ), but this will be the topic of my next blog. So for the moment, I leave it there, confirming that the Government is a key actor in Supported Self-supply. Overall, the concept of Self-supply clearly has an important role to play if we want to provide some (even if it’s just basic) level of services to everyone – there simply is no alternative in reaching specific target groups, especially in the remote rural areas. However, we also have to be aware that Self-supply has its limitations, and that there are aspects related to Self-supply which have to be addressed with a lot of care (e.g., quality of the services installed, potential over-exploitation of water resources by private households). I also perceived that several people and organizations are looking for shiny examples of countries where Supported Self-supply was implemented at scale, which then could be replicated elsewhere (the “Blueprint Fallacy” which unfortunately is quite common in the water sector, particularly among global players). However, at the moment there are only a few such examples (e.g. manual drilling in Nigeria/Lagos, Domestic Rainwater Harvesting in Thailand, the Upgraded Family Wells in Zimbabwe), and many of these cases refer to contexts where government services were weak or collapsing – which do not make for a good example for promotion, particularly with government agencies. With all due respect, but which government agency would like to copy the experience of Zimbabwe in the 1990s? Thus, the examples are not as shiny as we wish. Nevertheless, the fact is that Self-supply actually took off in some places while government services, institutions and the whole economy was collapsing – a clear hint to the power of this approach, even under difficult conditions. But we also need to figure out how governments can foster the approach – that is, how to better Support Self-supply. Revisit the basic terms, definitions and concepts and make them more intuitive to understand. In cooperation with research institutions, improve our understanding of the potential and limits of Self-supply, and the variety of benefits it can generate (not only in health, but also in productivity, income-generation, equality and non-discrimination, inclusiveness, well-being, cost-savings to government agencies, etc.). Keep up the dialogue with people and organizations who think that Self-supply is a nightmare and should be hindered wherever possible. Their arguments will help us guide future research and for making a better case where and why Self-supply has a role to play. Engage with actors (particularly non-profit organizations) who undermine existing and flourishing markets by giving away stuff for free. Giving away products and services for free is not Self-supply, does not build up capacity with anyone and damages existing supply chains. Thus, looking back to the first 12 years of promoting Self-supply, I think we have come a long way. Given that before 2004 the term did not even exist, the change is truly remarkable – and RWSN was the lead agency of making this sea change in public awareness possible. At the same time, we still need to work on the fundaments, the walls and the windows of the Self-supply house, and we need to make them strong enough to keep growing in the coming 12 years and beyond. I hope that many of you will be part of this journey, and I invite you – as a small first step – to subscribe to the Dgroup on Accelerating Self-supply, which is a platform for discussion, exchange and mutual learning, and to contribute to the dialogue on that platform. I look forward to hearing from many of you there!